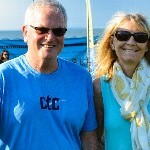 Join me in supporting the CT Challenge and help provide important resources for cancer survivors. I am training to ride in the CT Challenge Ride on July 27th. Your support for my ride will help cancer survivors of all ages in so many ways - from summer camp for children to college for teenagers and confidence-building adventure trips for young adults to programs in exercise and nutrition for all ages at the groundbreaking Mission Training Center. I hope you will support my efforts by making a secure online donation by clicking on the "Donate Now" button or by printing out a donor form and sending it in with a check (click here for the form). Thank you so much. Together, we're changing lives.